DIAL: Black glossy glit dial with date aperture at 3 o’clock, tritium hour markers. Mercedes hour and pencil minutes hand, lollipop seconds and small red color GMT hand indicating the second time zone. CASE: 40mm, stainless steel with red and blue rotating bezel and acrylic glass with loupe for date at 3 o’clock. CONDITION REPORT: Mint condition, the dial and hands are in 10/10 condition. The case is unpolished and retains its original bevels and pinholes. The bezel insert has faded naturally over time, but is in excellent intact condition. This is one if not the best example of this reference we have seen. 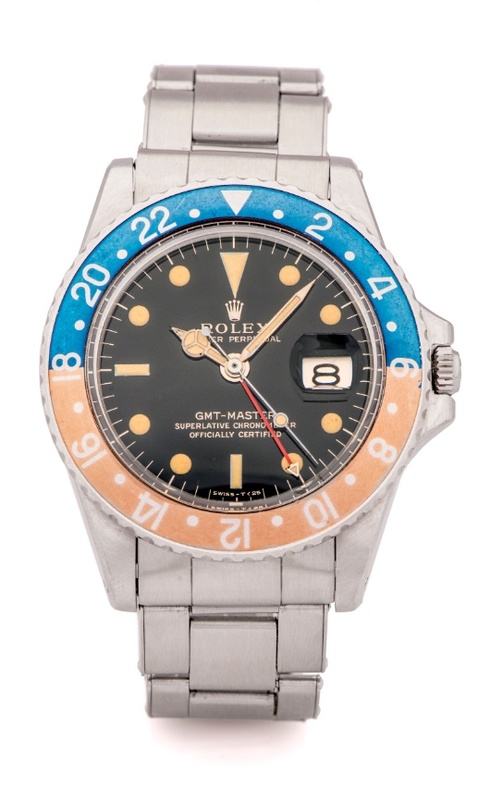 NOTES: The iconic Rolex GMT Master was developed as a collaborative project between Rolex and Pan Am Airways. As in the 1940s and 50s flying distances got longer and the pilots travelled through multiple time zones, Pan Am asked Rolex in the early 1950s to develop a watch which could tell different times simultaneously. The model was launched in 1954 and the watch was issued by the airline to their crews on long-haul flights. The first GMT (Ref. 6542) was a regular Turn-O-Graph (Ref. 6202) with a different bezel and a modified movement. The Rolex GMT was designed as an aviator watch: The newly introduced fourth hand allowed the display of an additional time, with the corresponding number markings on the outer bezel. Pilots used the second time to display the Greenwich Mean Time (GMT), which led to the name Rolex GMT Master.